Plans to erect the world's tallest statue in Mumbai, a $500 million effigy of Shivaji, are under fire from millions of Indians struggling in poverty. The Shiv Smarak or Chhatrapati Shivaji Maharaj Memorial is a monument under construction to honour the 17th century Indian warrior king and founder of the Maratha Empire, Chatrapati Shivaji Maharaj. 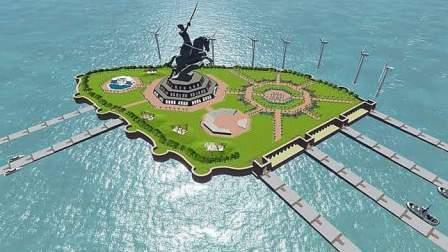 The statue is to be located in the Arabian Sea, near the coast of Mumbai, in the Indian state of Maharashtra. The statue will be orientated to face Mumbai, on a manmade island and will stand 210m tall, and be the world's tallest statue when completed. The project area encompasses over 16 hectares will include a theatre, food court, and library. It is due to be finished in 2021. The foundation stone of the $500 million+ statue was laid by Prime Minister of India, Narendra Modi on December 24, 2016.